It can be a tricky balance designing a garden for both children who want to play and adults who want to relax as well. Creating a garden that meets both the needs of active children and wearied parents is entirely possible with careful thought. This example of an overlooked, underloved and uninspired garden in the suburbs shows how using zones allows you to meet the needs of both children and parents. This offending garden is a North Facing overlooked house in Manchester. After some extensive house remodelling, the builders had used and abused the back garden leaving it as a compacted mess. It has the trademark random overgrown tree, the unimaginative square lawn and the odd out of control shrub. It retains too much water and has all sorts of different levels and bumps. 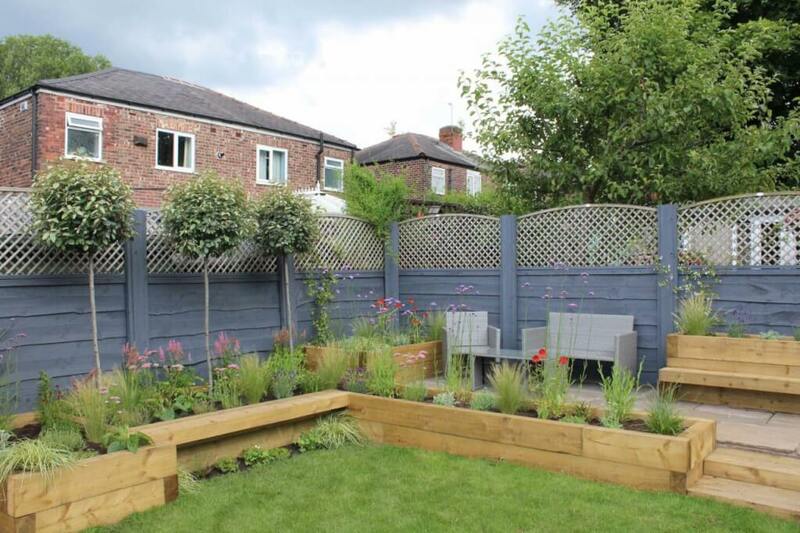 The clients asked Garden Ninja to transform this space into an area that would provide them with an area for two hard working parents to relax and also an exciting space where their young children could play safely. They were also keen to have a wow factor and some brightly coloured plants to encourage wildlife. I got the coffee on and got to work designing them a haven of peace for the adults and somewhere fun for their children. In a small garden, it’s easy to try and cram as much in as possible. We established that they definitely wanted a substantial lawned area for the children to play on. This would become the children’s zone which could evolve over time and wasn’t too precious being used by an army of screaming children, a wendy house, battlefield or makeshift football pitch. The adult zone was designed as a raised terrace area which would be screened off in part by planters and raised borders on each side. There was careful access planned should a parent need to quickly get to the children zone and to help provide flow around the garden. 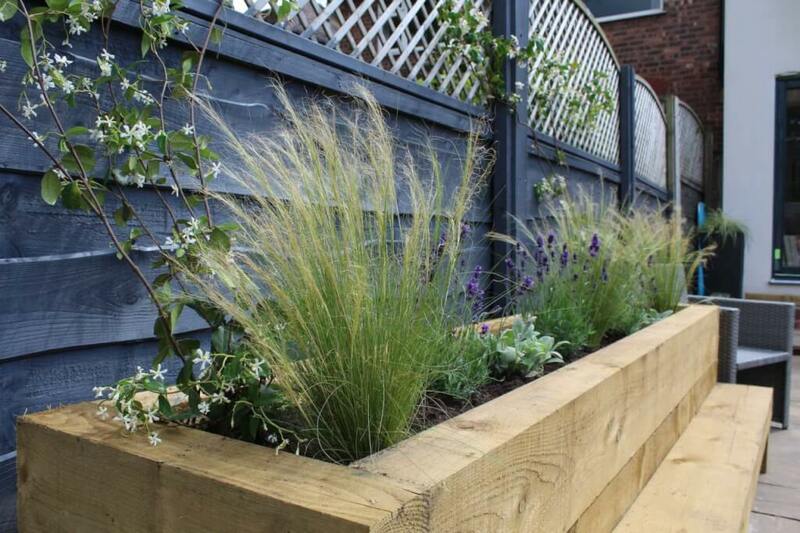 These beds and borders helped also break up the neighbouring views giving privacy. They also needed storage and access for bikes. By using cut-through paths to the children’s lawn, it allows movement between the zones and helps join the garden together. Yet encasing the zones in borders with various heights it gives the feeling of privacy when in each zone. By using cut-through paths to the children’s lawn, it allows movement between the zones and helps join the garden together. Yet encasing the zones in borders with various heights it gives the feeling of privacy when in each zone. 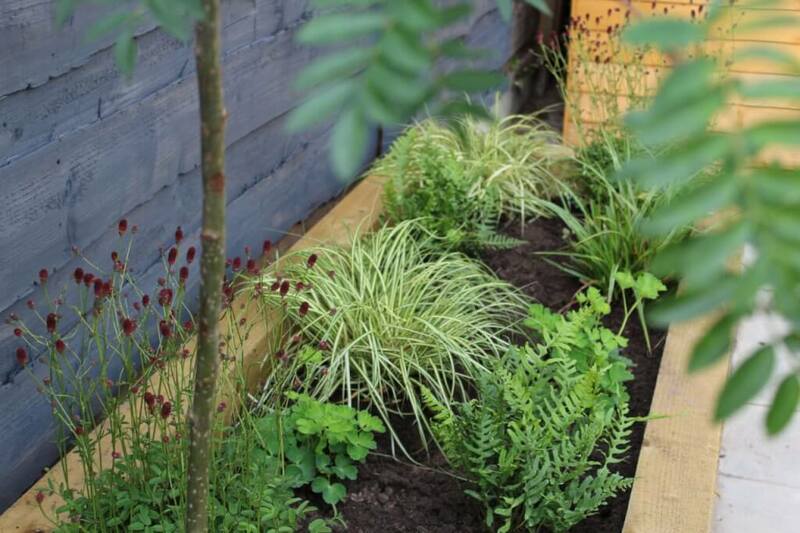 The raised beds around the children zone contained a mix of super tough hardy herbaceous perennials, grasses and shrubs. In addition to this, they also had woven through them some beautiful delicate specimens. Thus giving a more sophisticated feel than just bedding plants and evergreen shrubs. These borders were designed to encourage visitors to want to investigate these plants further, ask questions and become engrossed in the drifts of planting rather than focusing on the small size of the garden. Seating is an important function of any garden. 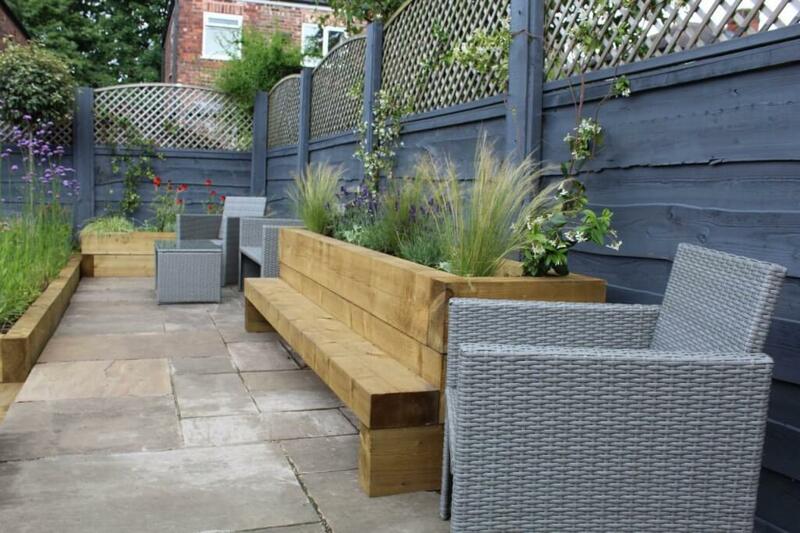 However, garden furniture can take up a lot of room and require storage in the winter months. 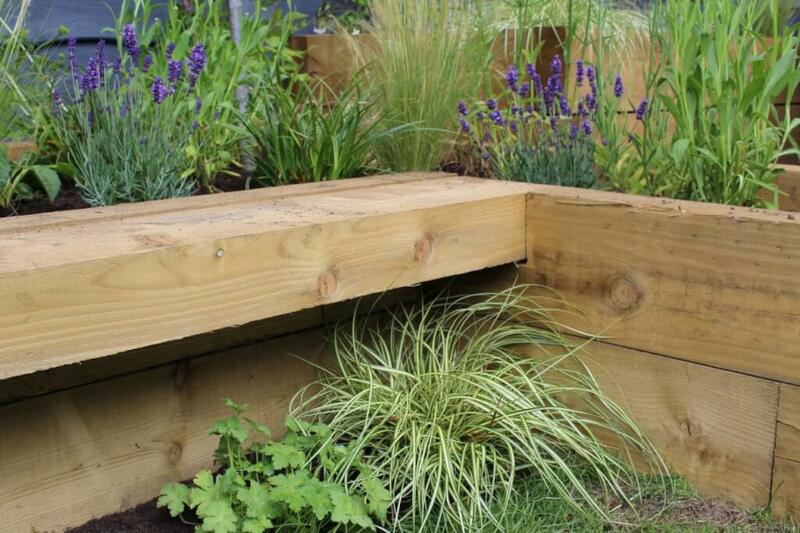 The use of timber raised beds in this garden design meant I could incorporate integrated seating in the form of benches. This gave the client far more seating for those impromptu BBQ’s, parties and children’s play time. It blends in perfectly with the garden and means they can chase the sun as it moves around this garden. By planting under one of the benches it helps pull the visitor almost into the garden. When sat there you get the feeling of being sat in the herbaceous border. It also means as you feet rub up against the Thyme you get the wonderful scent of it. The far left of the garden was dappled shade for most of the day due to a fence and neighbouring trees. By choosing shade loving plants, such as Sanguisorba and ferns that would thrive in the moist conditions I brightened up this area. I also use the two trees, Malus ‘Sparta’ and Sorbus ‘Joseph Rock’ to give some height and further privacy to this area. The plants chosen are all super pollinators so great for bees and wildlife. I created a planting scheme that brought colour throughout the season allowing the garden to morph over the seasons extending interest. Do you have a garden that needs a Garden Ninja transformation? 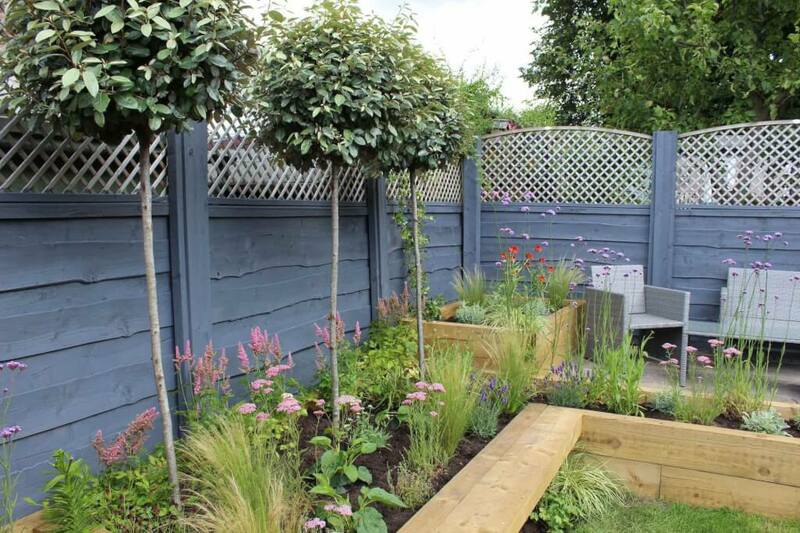 Why not get in touch with me to start your own dream garden design! I can thoroughly recommend Lee for both his garden design and installation service. First class service. The design phase was detailed and thoughtful. Lee clearly listened to what our priorities were, turning a sad north facing plot into a colourful space that worked for both adults and two children. Lee's choice of plants was fantastic and looking out on the design daily it still stops us in our tracks. Thanks Lee, and best of luck.